Here are the best Barbados resorts and hotels - not all-inclusive, picked and are listed for your convenience: Fairmont Royal Pavilion, Bougainvillea Beach Resort, Time Out Hotel, Radisson Aquatica Resort, Southern Palms Beach Club, Port St. Charles, Hilton, Coconut Court Beach Hotel, Accra Beach Hotel & Spa. St. Peter’s Bay Barbados has won many awards including a Certificate of Excellence 2015 from Tripadvisor for being one of the best Barbados resorts. St. Peter’s Bay is located just south of Speightstown on the northwest coastline, this resort is situated on 4-acres along the beautiful white sand beach of St. Peter’s Bay. This Barbados resort is associated with two other nearby properties which are Port St. Charles Yacht Club and Port Ferdinand Luxury Marina and Residences. While staying at St. Peter’s Bay you will enjoy complimentary water taxi service to all three properties allowing you to enjoy numerous amenities. The four-story buildings have a traditional Bajan-style architecture and contain 57 units that range in size from 2,700 to 6,300 square feet. Each of the three-bedroom suites has a luxurious interior décor of soft colors with big views of the Caribbean Sea from two or more terraces which include a private spa pool. The massive four-bedroom penthouse suites have oversized rooftop terraces of almost 1,000 square feet with a private pool, barbeque area and full wet bar. All accommodations have a fully equipped kitchen for you to enjoy as well as your own laundry area. During the day you will enjoy the solitude you seek on the white sand beach which is surrounded by a tropical landscape that includes numerous trees for shade and seclusion from other guests. You will enjoy superb swimming and snorkeling in the clear blue water as well as be able to view incredible wildlife like the Hawksbill turtle. In addition while you are staying at St. Peter’s Bay you can arrange other watersport activities through your own personal concierge. Everyone will be delighted hanging out by the lagoon-style freshwater swimming pool which has a wonderful view of the Caribbean Sea. You can enjoy lunch or a cold libation at the Gazebo Bar and Grill which serves pool and beachside. When you want to work-out you can visit the state-of-the-art fitness center or stretch out at the yoga and pilates studio as well as visit the Sandbox Tree Spa at Port Ferdinand Luxury Marina and Residences. Dining options are limited at this Barbados resort with only the Gazebo Bar and Grill serving eclectic casual cuisine for breakfast, lunch and dinner. But with a fully equipped kitchen and a grocery store nearby, you can create your own island dishes. The complimentary water taxi at St. Peter’s Bay Barbados can also take you to Port Ferdinand where you can indulge in fine dining at 13/59 or enjoy pizza at the Quarterback Bar and Pizzeria. The St. Peter’s Bay Barbados is very family-friendly but does not offer any type of kids club. Your concierge can arrange for babysitting as well as numerous family oriented activities. The Fairmont Royal Pavilion is a luxury Barbados resort that is ideally situated for adults, although children under 9 years of age are admitted during high and holiday seasons. The low rise property is set along a three-quarter mile stretch of St. James Beach located on the western coastline of the island near Porter and just north of nearby Holetown. The resort has a quiet relaxed feel with under a 100 rooms, junior suites and villas. The guest rooms are large with a nice private balcony that overlooks the ocean. Junior suites are steps away from the water and an even bigger view from the private patios. Most accommodations include butler service. The property boasts a superb beachfront location with nice swimming and offers complimentary non-motorized watersport equipment like kayaks, windsurfs and paddle boats. There is also one freshwater swimming which is surrounded by a lush garden area and the Tamboras Bar is adjacent. The complex has two restaurants that serve a variety of international cuisine with ala carte menu service. The Palm Terrace Restaurant has big views and exceptional Caribbean inspired cuisine. Nightlife and other dining options are just a short taxi ride away at Holetown. The property has lighted tennis courts and a fitness onsite and in-room spa treatments area available. Activities for children are limited to high and holiday seasons when the resort does offer a Kids Club with supervised games. Rooms: Fairmont Royal Pavilion Barbados resort is a complex of low rise buildings with 72 rooms, suites and villas. Oceanfront Deluxe rooms are 500 square feet with a private balcony that provides breathtaking views. Beachfront junior suites are steps away from the ocean with an additional 250 square feet patio and butler service. The three-bedroom Sea View villa includes butler service, has recently been renovated and is available as a one, two as well as a three-bedroom villa. Restaurants: The complex has two restaurants onsite that include Taboras Restaurant is located poolside where guests will find ala carte menu service with exceptional island and international cuisine for breakfast, lunch and dinner. The Palm Terrace Restaurant is open serving locally inspired cuisine from an ala carte menu on selected nights of the week. Dining options exist off-property at the local Lone Star Restaurant as well as in nearby Holetown. Beach: This portion of St. James Beach is spectacular with calm waters, soft sand and plenty of vegetation for shade. Beach Activities: This resort offers a complete array of complimentary non-motorized watersports equipment for windsurfing, standup paddle boarding, snorkeling, sailing, kayaking and paddle boats as well as sea floats. The water is calm and good for swimming with turtles at this location. Entertainment: There is no scheduled nightlife at Fairmont Royal Pavilion Barbados resort. The Tamboras Bar is located conveniently next to the freshwater swimming pool. Guests are a short taxi ride away from nightlife on 2nd Street in Holetown. Kids Activities: There is a seasonal Kids Club that offers organized activities for children. Babysitting services can be arranged by the resort. This property has restrictions on age where children under 9 years of age are welcomed during high-season and children above the age of 10 years old may visit years round. Attractions: Fitness Center and Tennis Courts onsite; Motorized and Non-motorized Watersports; Scuba Diving; Holetown; Shopping; Sea Safari; Rum and History; St. Ann’s Fort; Cherry Tree Hill; Gun Hill; Harrison’s Cave; Off-road Adventure; Atlantis Submarine; Royal Westmoreland Golf Club; Sandy Lane Golf Course; Barbados Golf Club; Scuba Diving; Limegrove Mall; Shopping; Horse Racing; Frank Hutson’s Sugar Museum; Hunte’s Garden; Sam Lord’s Castle; Bathsheba; Welchman Hall Gully. Pools: Fairmont Royal Pavilion Barbados resort has one freshwater swimming pool located at this resort. The property also has a large Jacuzzi and the Tamboras Bar is located poolside. Bougainvillea Beach Resort is a mid-rage and family-friendly Barbados resort situated along Maxwell Beach which is located on the southern coastline in Christ Church Parish. The four-story property has a beachfront location that offers plenty of activities for children and adults. Accommodations at this resort feature studios as well as one and two-bedroom suites. All are furnished with a kitchenette or full kitchen and a private balcony or patio. The complex offers a variety of complimentary non-motorized watersport equipment for guests like kayaks, wind surfs and boogie boards. There are plenty of other events to keep you and your family busy like the lawn game area, playgrounds and game room with table games such as billiards. There are three freshwater swimming pools onsite that have waterfalls and one has a swim-up bar. The resort has two beachfront restaurants onsite that serve ala carte menus for breakfast, lunch and dinner. The property is quiet at night and guests can choose to explore St. Lawrence Gap or Bridgetown for more dining as well as nightlife opportunities. There is an extensive Kids Club for children 3 to 12 years old that includes movie and dinner night events as well as a variety of supervised games. Rooms: Bougainvillea Beach Barbados resort is four-story Mediterranean-style complex with 138 accommodation that range from studios to one and two-bedroom suites. Studios start at 329 square feet and have a private balcony as well as a kitchenette. One-bedroom suites range from 476 to 1,400 square feet and two-bedroom suites are from 691 to 1,100 square feet. Each suite has a full kitchen and a private balcony or patio. Accommodations are offered with garden, ocean and beachfront views. Restaurants: The resort has two restaurants onsite with Lanterns by the Sea serving an ala carte menu with an international selection of cuisine for breakfast, lunch and dinner as well as themed buffet-style dinners on selected nights of the week. The Water’s Edge Restaurant is ideally located on the beach and boasts a nice Caribbean inspired ala carte menu as well as special tasting dinners of small plates. Beach: Maxwell Beach is a superb stretch of soft sand that offers plenty of area for relaxing under an umbrella or one of the many palm and coconuts trees that dot the landscape. Beach Activities: Bougainvillea Beach Barbados resort offers Non-motorized watersport equipment that is complimentary and includes such items as boogie boards, windsurfs and standup paddleboards. The water is generally calm along this section of the island and is good for swimming. Entertainment: There is no scheduled nightlife on this resort and the grounds are generally quiet in the evening. There is a poolside and swim-up bar on this property. Nightlife opportunities exist a short taxi ride away in Bridgetown or St. Lawrence Gap. Kids Activities: Bougainvillea Beach Barbados resort offers a Kids Club for children 3 to 12 years of age throughout the day and during holiday season the Kids Club has movie as well as dinner nights for children. There is a game room, playground and an indoor Adventurland onsite. Babysitting services can be arranged by the resort for an additional fee. Attractions: Mini-Grocery Store, Fitness Center, Tennis Courts and Waves Spa onsite; Atlantis Submarines; Motorized and Non-motorized Watersports; St. Lawrence Gap; Bridgetown; Oistins; Shopping; Barbados Golf Club; Barbados Museum and Historical Society; Rafza Nehaul; Pelican Craft Center; Morgan Lewis Sugar Mill; National Heroes Square; George Washington House; Harry Bayley Observatory; Rum Factory and Heritage Park; Harrison’s Point Lighthouse. Pools: There are three freshwater swimming pools which are complete with meandering rivers, waterfalls and one swim-up bar. The pool areas have sufficient deck space for relaxing and are surrounded by plenty of lush gardens. Timeout Hotel is a budget-type Barbados resort that is situated steps away from Dover Beach which is located on the southwestern coastline of the island adjacent to St. Lawrence Gap in Christ Church Parish. This low rise resort does not offer many amenities and is perfect for people that are looking to explore the nearby attractions, relax on the beach or experience the local Caribbean culture. Accommodations are average in size and not all rooms have a private balcony or patio. Motorized and non-motorized watersport equipment is available for rent by several vendors on the beach. The Sporting Pig is the only restaurant onsite serving breakfast, lunch and dinner with ala carte menu service as well as poolside signature island cocktails. Guests can walk to St. Lawrence Gap for additional dining and nightlife adventures as well as emerging themselves in the local island culture. The one freshwater swimming pool is centered in the middle of the complex and offers space for lounging and relaxing. There is not a kids club associated with this property. Rooms: This Barbados resort has 76 rooms in four different categories which include Standard, Superior, Pool view and Deluxe. Rooms are normal in size with a Caribbean décor. Superior and Pool view rooms have a private patio or balcony. Restaurants: The Sporting Pig is the only restaurant onsite and serves an ala carte menu for breakfast, lunch and dinner. Multitudes of dining options exist along the St. Lawrence Gap which includes outstanding dining experiences at the Waterside Restaurant which features seafood specialties, Pisces where casual dining reigns and Café Sol for superb Mexican dishes. Beach: Dover Beach is a perfect stretch of soft sand which is surrounded by a lush tropical landscape. There is plenty of space to relax under an umbrella. Beach Activities: The beach area has plenty of vendors with motorized and non-motorized watersport equipment for rent. Dover Beach is good for swimming with the calm waters. Entertainment: Nightlife and entertainment are just steps away from this Barbados resort in the electrifying area of St. Lawrence Gap where several unique nightclubs like the Sugar Ultra Lounge reside. Kids Activities: There is not a kids club associated with this property. Babysitting services can be arranged by the resort for an additional fee. Attractions: Atlantis Submarines; Motorized and Non-motorized Watersports; St. Lawrence Gap; Bridgetown; Oistins; Shopping; Barbados Golf Club; Barbados Museum and Historical Society; Rafza Nehaul; Pelican Craft Center; Morgan Lewis Sugar Mill; National Heroes Square; George Washington House; Harry Bayley Observatory; Rum Factory and Heritage Park; Harrison’s Point Lighthouse: Orchid World; Flower Forest; Harrison’s Cave; Island Safari. Pools: There is one freshwater swimming pool onsite that is centered in the middle of the complex. The Sporting Pig supplies an ample amount of island cocktails poolside. The Radisson Aquatica Resort is a great option for people looking for location, beach and off-property activities. 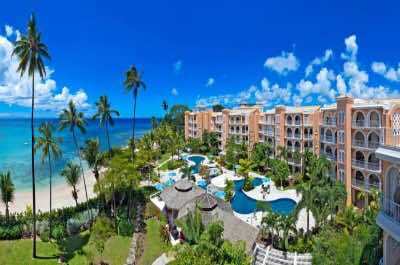 This high rise Barbados resort is situated on a one-mile stretch of white sand along Pebbles Beach on the Carlisle Bay and Aquatica Gap area which is along the western coastline of the island near Bridgetown. The beach area is nice with plenty of opportunities to rent motorized and non-motorized watersport equipment from a local vendor. The complex has a variety of rooms and suites from beach view to beachfront to ocean view to business class rooms to one-bedroom suites. All rooms and suites have at least one private balcony or patio. The freshwater swimming pool is situated along the beachfront and patrons can indulge in lunch fare at Neptune’s Grill. The resort also features the Aquatica Restaurant which is located on pier which gives guests big views of the ocean while dining. There are other dining options within walking distance such as Sahara Arabic Grill and Falafel or Mama Mia’s Italian Deli and Pizzeria. Nightlife activities can be found by guests at the Aquatica Gap and Bridgetown where Shakers Bar and Grill is a favorite. This resort accommodates children but there is not an organized kids club on the property. Rooms: Radisson Aquatica Barbados resort is a high rise complex has 124 rooms and suites with private balconies or patios. Rooms are available in categories from beach view to beachfront to ocean view to business class rooms. Larger junior suites and one-bedroom suites have two private balconies or patios as well as big views of Bridgetown, beach and ocean. Restaurants: There are two restaurants onsite that includes the beachside Neptune’s Grill serves all of your favorite salads, sandwiches and light snacks for lunch. The Aquatic Club Restaurant is situated on a pier with big views of the ocean and serves a buffet-style breakfast and contemporary cuisine from an ala carte menu for lunch and dinner. Guest can venture around Bridgetown where patrons will find a variety of restaurants like Buzo Osteria Italiana and Cuz’s Fish Shack. Beach: The one-mile stretch along Pebbles Beach is located at Carlisle Bay which is situated on Needham’s Point peninsula has soft white sand with enough space for plenty of umbrellas and spots to relax. Beach Activities: Radisson Aquatica Barbados resort offers plenty of opportunities to play on the beach with multiple vendors renting motorized and non-motorized watersport equipment. The water is calm here offering good swimming opportunities. Entertainment: There is no nightly entertainment at this resort. Guest can venture to Bridgetown where patrons will find a variety of nightclubs and lounges like Shakers Bar and Grill. Kids Activities: There is not a kids club associated with this resort. Attractions: Radisson Aquatica Barbados resort has a Fitness Center onsite; Atlantis Submarines; Motorized and Non-motorized Watersports; St. Lawrence Gap; Bridgetown; Oistins; Shopping; Barbados Golf Club; Barbados Museum and Historical Society; Rafza Nehaul; Pelican Craft Center; Morgan Lewis Sugar Mill; National Heroes Square; Garrison Historic Area; George Washington House; Harry Bayley Observatory; Rum Factory and Heritage Park; Harrison’s Point Lighthouse: Orchid World; Flower Forest; Harrison’s Cave; Island Safari. Pools: This resort has one freshwater swimming pool that is just steps away from the beach. The Southern Palms Beach Club is a good option for families and couples that want the option of off-property entertainment. 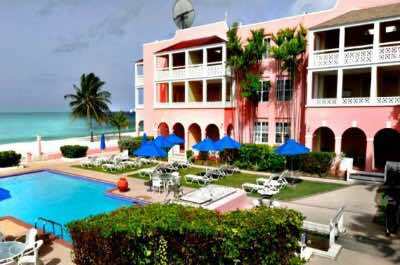 This low rise Barbados resort is located on Dover Beach at St. Lawrence Gap along the western coastline of the island. The beach is beautiful white sand that is dotted with umbrellas and the complex offers complimentary non-watersport activities such as boogie boards and windsurfs. Accommodations at this property include spacious rooms with private balconies or patios as well as large junior and luxury suites that are furnished with a kitchenette as well as a private balcony or patio. Rooms and some suites can be adjoined for families that are looking for more space. There is the Garden Terrace Restaurant onsite that features buffet-style dining and ala carte menu service for breakfast, lunch and dinner. The Khus Khus Bar is ideal for light lunch snacks and island libations. The resort is within walking distance to many fine dining options like Sharkey’s as well as nightlife opportunities at the Reggae Lounge. There is live music onsite at the Garden Terrace Restaurant three nights a week. The resort offers a fitness center and a spa for that relaxing treatment. There is not a kids club onsite but this property has plenty of activities for children like miniature golf, shuffleboard and tennis courts onsite. Rooms: Southern Palms Beach Club Barbados resort is a Colonial-style six building low rise complex with 92 rooms and suites. Rooms are complete with views of the garden, pool or ocean and are furnished with a private balcony or deck. Junior suites are spacious with kitchenette and have a private balcony or patio that offers views of the ocean and beach area. Luxury suites include a kitchenette and a private balcony or patio. Rooms and suites can be adjoined for larger families who need more space. Restaurants: The resort has the Garden Terrace Restaurant onsite which serves a buffet-style and ala menu service for breakfast as well as an eclectic international and local cuisine from an ala carte menu for lunch and dinner. Lunch and evening snacks can be found at Khus Khus Bar as well as a great Sunday Pie Buffet Lunch for brunch. This resort is within walking distance to several dining options in St. Lawrence Gap which include the Harlequin Restaurant for Caribbean specialties and Apsara Samudra for pan-Asian cuisine. Beach: Dover Beach is a lovely stretch of white sand that has plenty of vegetation like palm and coconut trees for shade. Beach Activities: Southern Palms Beach Club Barbados resort offers a multitude of complimentary non-motorized watersport equipment such as boogie boards, windsurfs and snorkels. There are also impromptu volleyball and soccer games along the beach area. The complex offers a complimentary scuba diving lesson once a week for guests. Entertainment: The Garden Terrace Restaurant has live music three nights a week and on Sunday during the day. There are plenty of nightlife choices for guests located in St. Lawrence Gap where the Old Jamm Inn is favorite for live reggae music nightly. Kids Activities: There is not a kids club at this resort but children have plenty of activities like miniature golf, shuffleboard and non-motorized watersports. Attractions: Mini-Golf Course, Fitness Center, Tennis Courts and Spa onsite; Atlantis Submarines; Motorized and Non-motorized Watersports; St. Lawrence Gap; Bridgetown; Oistins; Shopping; Barbados Golf Club; Barbados Museum and Historical Society; Rafza Nehaul; Pelican Craft Center; Morgan Lewis Sugar Mill; National Heroes Square; Garrison Historic Area; George Washington House; Harry Bayley Observatory; Rum Factory and Heritage Park; Harrison’s Point Lighthouse: Orchid World; Flower Forest; Harrison’s Cave; Island Safari. Pools: Southern Palms Beach Club Barbados resort has two freshwater swimming pools onsite that include a fabulous quiet pool and one pool overlooks the ocean. There is plenty of room for umbrellas on the surrounding decks and garden areas. Port St. Charles Yacht Club is the perfect yacht and beach resort for families and sailors of all ages. This low rise Barbados resort is situated on Heywoods Beach and the manmade Sunset Island which is located on the northwestern coastline of the island near Speightstown in St. Peter Parish. The complex is spread out over 22 acres of very secluded tropical gardens and guests are shuttled around the resort by on-demand water taxis. Surrounded by a lagoon, Sunset Island is the center of the community and is perfect for mooring yachts at the resort. Accommodations at this resort range from one-bedroom to six-bedroom apartments and villas. Each has a full kitchen, view of the beachfront or lagoon, private balcony or patio and some have private boat slips. There is the Yacht Club Restaurant onsite which serves an ala carte menu of international and local cuisine for lunch as well as dinner but does not serve breakfast. The complex has live music on Friday nights at the restaurant. Dining and nightlife options are close at hand with a short taxi ride to Speightstown where several fantastic restaurants and nightclubs reside. There are two freshwater swimming pools including one on the island with a swim-up bar. The property has a fitness center, tennis courts and spa onsite for guests. There is a Kids Club on this resort during high season and other high occupancy times of the year. 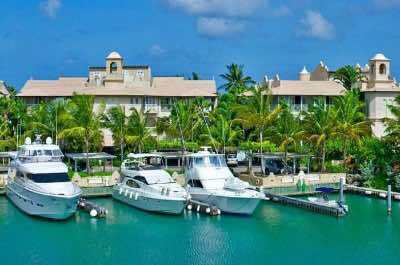 Rooms: Port St. Charles Barbados resort is a low rise complex, composed of 29 villas and apartment-style suites. Each type of rental has a different décor based on the owner’s preference with many of the rentals having a nautical yacht club interior. One-bedroom apartments start at 825 square feet with a separate living area. Two and three-bedroom apartments as well as villas range in size from 1,600 to 3,500 square feet of nautical and beachfront luxury. Four, five and six-bedroom villas and apartments range in size from 2,700 to 6,000 square feet. All apartments and villas have a full kitchen, private balcony or patio as well as views of the lagoon, marina, ocean or beachfront. Some accommodations offer a private boat slip and a plunge or a freshwater swimming pool. Restaurants: There is the Yacht Club Restaurant on Sunset Island which is reserved for guests, members and tenants of the resort. The restaurant offers an international and Caribbean-style ala carte menu service for lunch and dinner. Guests can find other dining options a short distance away in Speightstown like the Lobster Pot for seafood and Island Plates which serves up healthy Caribbean dishes. Beach: Sunset Island has a beach area that is soft sand with plenty of loungers. Heywoods Beach is perfect for lounging under a palm or coconut tree. The waters are calm at this lagoon location and swimming with turtles is possible. Beach Activities: Beach activities are available at Heywoods Beach where a number of vendors have motorized and non-motorized watersport equipment for rental. Sailing is the primary purpose of this resort. Entertainment: Port St. Charles Barbados resort has live music on Friday nights at the Yacht Club Restaurant. Patrons may also venture five-minutes by taxi to Speightstown where there are numerous nightclubs with DJ’s or live music such as Fisherman’s Pub and the Little Bristol Beach Bar. Kids Activities: The Kids Club located on this property is open only during high season. The Kids Club offers a variety of organized activities like sailing lessons, games as well as arts and crafts. Babysitting services can be arranged by the resort. Attractions: Fitness Center, Tennis Courts and Shopping onsite; Speightstown; Speightstown Mural; Apes Hill Golf Club; Barbados Wildlife Reserve; Animal Flower Cave; Arlington House Museum; Motorized and Non-motorized Watersports; Shopping; Farley Hill National Park; Arlington House Museum; St. Nicholas Abbey; Barbados Wildlife reserve; Grenade Hall Forest and Signal Station; Horseback Riding; Arlington House Museum; Royal Westmoreland Golf Club. Pools: Port St. Charles Barbados resort has two freshwater swimming pools onsite. Sunset Island has one pool with a large deck area and a nice swim-up bar for guests. Hilton Barbados Resort is a family- friendly high rise complex located along Carlisle Bay on Needham’s Point peninsula on the western coastline of the island just minutes away from Bridgetown and St. Lawrence Gap. The expansive beach space is excellent for all types of watersport activities that are provided by various vendors in the area. Rooms and suites are standard size with views of Carlisle Bay as well as the ocean with private balconies. Corner suites have two balconies for viewing pleasure. There are several restaurants onsite that serve a variety of cuisine from light snacks at Cuppa Café to fine casual dining at The Grille. There is plenty of nightly entertainment within the resort at Careenage Bar and the Water’s Edge Bar. Other dining and nightlife options are available just minutes away by taxi in neighboring Bridgetown and St. Lawrence Gap. The complex has a fitness center, tennis courts and a spa onsite when guests are looking for that relaxing treatment. The Kidz Paradise Club has two divisions for age groups. The Groovy Kidz Club is open to children 4 to 7 years of age and the Cool Kidz Club is reserved for children 8 to 13 years of age. This property has babysitting services for an additional fee. 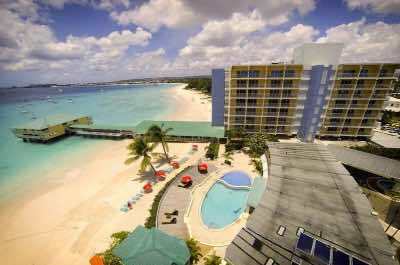 Rooms: This high rise Barbados resort has 355 rooms and suites with views of the bay and ocean. Guest rooms are standard size with a private balconies or patios. Suites include a two balcony corner as well as the larger Prime Minister suite. Suites have a a separate living area and private balcony. Executive suites are located on the top floors and boast big views and a private balcony. 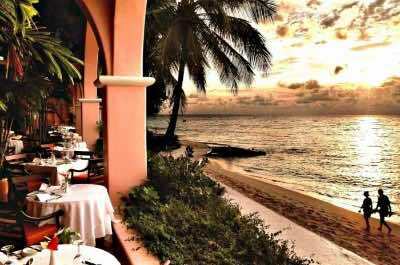 Restaurants: Hilton Barbados Resort has four restaurants that range from snacks to fine dining. Cuppa Café boasts a wide variety of snacks and to-go items; the Lighthouse Terrace Restaurant serves eclectic international cuisine with ala carte menu service for breakfast, lunch and dinner and The Grille boasts fresh seafood as well as grilled meats with ala carte menu service in the evening. The Water’s Edge Bar located poolside is open for libations and light snacks throughout the day as well as evening. Carneege Bar serves tapas as well as signature cocktails from early morning to late evening. Guests may also venture to nearby Bridgetown and St. Lawrence for additional dining options like the Waterfront Café and Lobster Alive for fresh seafood delights. Beach: This beach area is one of the largest on the island. The stretch of white sand is wide and over one-mile long. Beach Activities: Activities along the beach include motorized and non-motorized watersports with plenty of vendors with equipment for rent. The ocean here is good swimming and you might see an occasional turtle. 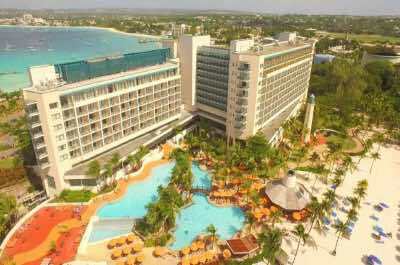 Entertainment: Hilton Barbados Resort has live music and Karaoke on selected nights of the week. Poolside bar service is available at the Water’s Edge Bar. Patrons can visit exciting nightlife options in St. Lawrence Gap and Bridgetown where Weisers Beach Bar is a favorite. Kids Activities: The Kidz Paradise Club has organized games and activities for children 4 to 13 years old. The club is broken into two separate age groups which children 4 to 7 will participate at the Groovy Kidz and older children from 8 to 13 are with the Cool Kidz club. Babysitting services are available for an additional fee. Attractions: Fitness Center, Tennis Courts, Dive Center and Spa onsite; Bridgetown; St. Lawrence Gap; Scuba Diving; Charles Fort; National Heroes Square; Harrison’s Cave; Horse Racing; Atlantis Submarines; Motorized and Non-motorized Watersports; Oistins; Shopping; Barbados Golf Club; Barbados Museum and Historical Society; Rafza Nehaul; Pelican Craft Center; Morgan Lewis Sugar Mill; National Heroes Square; Garrison Historic Area; George Washington House; Harry Bayley Observatory; Rum Factory and Heritage Park; Harrison’s Point Lighthouse: Orchid World; Flower Forest; Island Safari. Pools: Hilton Barbados Resort has a bi-level freshwater swimming pool complete with bar service and a nice tropical garden. rk; Arlington House Museum; St. Nicholas Abbey; Barbados Wildlife reserve; Grenade Hall Forest and Signal Station; Horseback Riding; Arlington House Museum; Royal Westmoreland Golf Club. Pools: This resort has two freshwater swimming pools onsite. Sunset Island has one pool with a large deck area and a nice swim-up bar for guests. 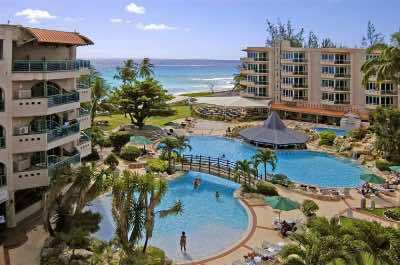 Coconut Court Beach Hotel is a mid-range family-friendly four story Barbados resort situated along the western coastline near Bridgetown in the Christ Church Parish. The beach area here is nice and expansive with plenty of palm and coconut trees. The complex has a retro Caribbean décor that includes accommodations from studio rooms to apartments. All rooms have a kitchenette, view of the ocean or garden and a private balcony. This property does not offer complimentary non-motorized watersport equipment but there are a number of vendors along the beach that can provide snorkeling, kayaking and jet skiing opportunities. The resort has two restaurants onsite that offer buffet-style and ala carte menu service with the Blue Room Sports Bar and Grill a favorite at night. The property provides live music several nights a week as well as a weekly manager’s cocktail party. Plenty of dining and nightlife experiences can be found with short taxi ride to Bridgetown and St. Lawrence Gap. There is a large freshwater swimming pool and Seagrape Beach Bar is great for a light lunch. The resort does not offer a kids club but there is a separate paddling pool for children. Rooms: This 1970s Caribbean-style Coconut Court Beach Barbados resort is composed of four four-story buildings that house 112 studio rooms and a small set of five apartments. The rooms include a kitchenette, private balcony and a view of the ocean. The apartments have more space, a kitchenette, private balcony and a view of the gardens. Restaurants: This Barbados resort has two restaurants that include the Deck Restaurant which serves a family friendly ala carte and buffet-style meals for breakfast, lunch and dinner. The Seagrape Beach Bar is ideal for a salad or sandwich on the beach; Blue Room Sports Bar and Grill has all your favorites when you are hungry at night. There is also excellent dining choices in nearby Bridgetown and St. Lawrence Gap which include Harbour Lights for fresh Bajan-style cuisine and the Bay Tavern for a great fish fry plate. Beach: The stretch of white sand beach at this resort is large and has plenty of vegetation like palm and coconut trees for shade. Beach Activities: Coconut Court Beach Barbados resort has a number of motorized and non-motorized watersports that are available by outside vendors along the beach. This portion of coastline is good for swimming and there are plenty of turtles to watch. Entertainment: Seagrape Beach Bar is ideal for drinks during the day. The resort has live music on selected nights at the Deck Restaurant. Blue Room Sports Bar and Grill boasts signature island cocktails throughout the night. There is a weekly manager’s cocktail party on Monday nights. Kids Activities: There is a separate kids paddling freshwater pool and the resort does not offer a kids club. Babysitting services can be arranged for an additional fee. Attractions: Atlantis Submarines; Motorized and Non-motorized Watersports; St. Lawrence Gap; Bridgetown; Oistins; Shopping; Barbados Golf Club; Barbados Museum and Historical Society; Rafza Nehaul; Pelican Craft Center; Morgan Lewis Sugar Mill; National Heroes Square; Garrison Historic Area; George Washington House; Harry Bayley Observatory; Rum Factory and Heritage Park; Harrison’s Point Lighthouse: Orchid World; Flower Forest; Harrison’s Cave; Island Safari. 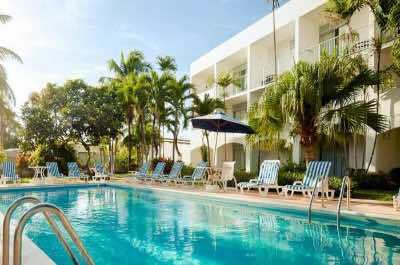 Pools: Coconut Court Beach Barbados resort has two freshwater swimming pools which include a separate kids paddling pool and a large rectangular pool surrounded by a nice deck for lounging. Poolside and beach service from Seagrape Beach Bar can help with thirst and hunger. 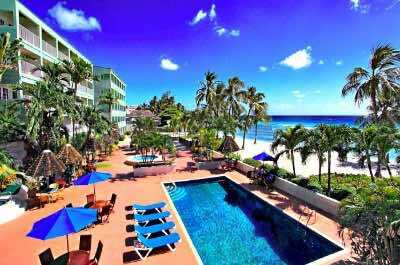 Accra Beach Hotel and Spa is a four-story family-friendly Barbados resort that is situated along Rockley Beach on the southwestern coastline of the island just south of Bridgetown in Christ Church Parish. The beach area is great with good white sand as well as plenty of trees and is a favorite with locals. The resort has several styles of accommodations from guest rooms to junior suites to two-bedroom suites. All rooms have a private balcony and views of the ocean or pool. Some rooms and suites have a private Jacuzzi. There is plenty to do on at this beach area with boogie boards and swimming with turtles as well as a wide assortment of motorized and non-motorized watersport equipment available from local vendors. There are two freshwater swimming pools including a swim-up bar and a quieter adults-only pool. There is poolside drink and food service by the Lagoon Bar. Several restaurants are onsite that serve breakfast, lunch and dinner including themed buffet-style nights. The Pacifika Kitchen is ideal for pan-Asian cuisine. The resort features karaoke, live music and DJ’s for nightly entertainment. Guests may travel a short distance to St. Lawrence Gap or Bridgetown for more dining and nightlife options. The complex has a fitness center and the Chakra Spa for that perfect treatment. The property offers Kids Club and there is a game room with air hockey, foosball and table tennis. Rooms: Accra Beach Hotel & Spa Barbados resort has 224 rooms and suites that are contained in two wings of four-story buildings. Rooms range from Oceanfront with a small Jacuzzi on the patio to larger Island View suites to a two-bedroom oceanfront suite with a Jacuzzi. The Ocean View Penthouse suite has two levels with a spacious living area. All rooms and suites have views of the ocean or pool. Restaurants: The complex has four restaurants that boast a wide variety of cuisine. The Coco Patch has a Caribbean-style menu for breakfast and lunch as well as a Sunday brunch service; The Fig Tree features themed buffet-style nights; Accra Deck serves European favorites with an ala carte menu and Pacifika Kitchen serves cuisine from the Pacific Rim like Japanese, Thai and Indonesian. The Lagoon Bar is perfect for lunch snacks and island cocktails. Beach: The Rockley Beach area at this resort is soft white sand and is a favorite with locals. There is plenty of vegetation like palm and coconut trees. Beach Activities: Accra Beach Hotel & Spa Barbados resort offers complimentary use of boogie boards, fins and goggles for swimming. Other motorized and non-motorized watersport equipment is available through vendors. This beach has good swimming and plenty of turtles at times. Entertainment: This resort features karaoke, live music and DJ’s several nights a week at the Lagoon Bar. The Sand Bar is open throughout the day and night with several happy hours. The complex hosts a weekly manager’s cocktail party and themed dinner buffets. There is nightlife a short distance away in Bridgetown and St. Lawrence Gap where guests can visit. Kids Activities: Accra Beach Hotel & Spa Barbados resort has a Kids Club with supervised games and activities. The resort has a game room and Play Hut for children. Babysitting services can be arranged for an additional fee. Attractions: Fitness Center and Chakra Spa onsite; Scuba Diving; Charles Fort; National Heroes Square; Harrison’s Cave; Horse Racing; Atlantis Submarines; Motorized and Non-motorized Watersports; Oistins; Shopping; Barbados Golf Club; Barbados Museum and Historical Society; Rafza Nehaul; Pelican Craft Center; Morgan Lewis Sugar Mill; National Heroes Square; Garrison Historic Area; George Washington House; Harry Bayley Observatory; Rum Factory and Heritage Park; Harrison’s Point Lighthouse: Orchid World; Flower Forest; Island Safari. 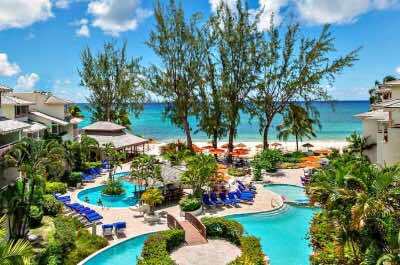 Pools: Accra Beach Hotel & Spa Barbados resort has two freshwater swimming pools with one featuring a swim-up bar and the second is a quieter adults-only. Both are surrounded by lush tropical gardens with ample deck space to lounge.